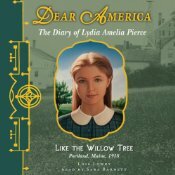 Dear America: Like the Willow Tree: Portland, Maine, 1918 by Lois Lowry, read by Sara Barnett. Grades 3-6. Scholastic Audiobooks, 2011. 4 hours 17 minutes. Review copy provided by my local library. In 1918, the influenza epidemic took both of Lydia's parents, leaving her and her brother with no place to go except for the nearby Shaker community of Sabbathday Lake. Grieving her family and struggling to adjust to the Shakers' different way of life, Lydia wonders if she'll ever fit in. Dear America. Honestly, I've avoided reading the books for a long time, even though they're super popular and I'm always recommending them to kids who have to read historical fiction. It wasn't until an adult patron exclaimed to me how fabulous the books were that I felt like I should give them a real chance. And now I'm kicking myself, wondering why it took me so long! It's important to stress to kids that these books are fiction because, frankly, Like the Willow Tree could just as easily have been a real diary. Facts about the time period and events are woven seamlessly into the narrative and bring the place and time to life. At the end, I had to remind myself that Lydia wasn't a real girl. The plot was well-crafted, as starting life at the Shaker village gave Lydia a solid reason for writing about Shaker customs and beliefs as she learned them. The one thing missing is an author's note, an especially painful omission since the book is so realistic and it will be easy for kids to assume that this is an actual historic diary. Narrator Sara Barnett was well-chosen for this role. She reads with a girlish inflection that is totally appropriate for an 11-year-old's diary and it adds to the authenticity of the audiobook. The book is read straight, not voiced at all, but again, that makes perfect sense for a diary. The pacing is nice and even and it's read clearly. I have respect for any narrator who sings snippets of songs in her book and Ms. Barnett is up to the challenge, singing the included Shaker songs in a high, clear voice. The music helps bring Shaker culture to life and choral music at the beginning and end of the audiobook help set the tone. I am definitely hoping that Ms. Barnett will continue creating children's audiobooks. So, if you've been avoiding the Dear America books for some reason, I urge you to stop it right now and give this book a try. Recommend the series to your young readers looking for historical fiction (but be sure and emphasize that they are FICTION, not real diaries). Like the Willow Tree is on shelves now. Hey, I'm an Audible affiliate, so if you purchase things after clicking on the links here, I may get a small commission.